This handout photo shows JAXA personnel celebrating after the capsule carried by the Hayabusa spacecraft burns up over South Australia leaving the heat-resistant pod to parachute back to land within the Woomera military zone. The Japanese deep-space probe became the first ever to collect asteroid dust during a seven-year voyage that ended with its return to Earth. A Japanese deep-space probe became the first ever to collect asteroid dust, during a seven-year odyssey that ended with its return to Earth over the Australian desert this year, Japan said Tuesday. The news crowns with success the journey of the unmanned Hayabusa probe, which five years ago made a pinpoint landing on an asteroid 300 million kilometres (186 million miles) from Earth -- about twice as far as the sun. Since the probe's return in June, scientists had carried out a lengthy analysis of the samples it brought back to confirm they were genuinely extraterrestrial after technical problems during the mission. "It's a world first and a remarkable accomplishment that it brought home material from a celestial body other than the moon," Japan's science and technology minister, Yoshiaki Takagi, told a news conference in Tokyo. The team was "unbelievably lucky," said Junichiro Kawaguchi, the manager of the Hayabusa project, telling reporters: "I don't know how to describe what has been beyond our dreams, but I'm overwhelmed by emotion." Hayabusa, which means falcon, blasted off in 2003 for its lonely odyssey, which at times appeared doomed. At one stage the probe lost contact with Earth for seven weeks, a glitch that added three years to its space voyage. It made a pinpoint landing in 2005 on the potato-shaped, revolving asteroid Itokawa, but an attempt to fire a pellet to whirl up dust failed, casting doubt on whether the probe had collected any extraterrestrial material. The car-sized probe left on Itokawa a plastic-wrapped metal ball bearing the names of 880,000 people from 149 countries, among them US filmmaker Steven Spielberg and British science fiction author Arthur C. Clarke. Japan cheered when Hayabusa ended its voyage in June, completing the longest ever space journey, which the Japan Aerospace Exploration Agency (JAXA) is seeking to have listed as a Guinness World Record. The Hayabusa probe burnt up on reentry into the Earth's atmosphere over the Australian Outback -- but not before releasing its heat-proof and sealed pod, which was picked up from the desert sand. Graphic on the Hayabusa space mission to collect material from a moving asteroid. 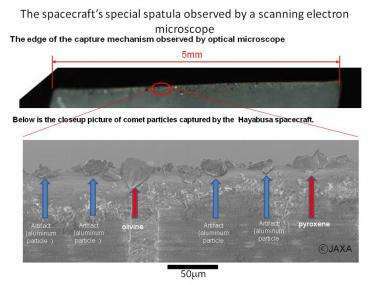 JAXA had confirmed that the pod did indeed contain minute particles, but it did not know for sure whether these were the valued bits of asteroid, or simply contaminants. 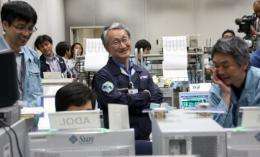 On Tuesday, after analysis using electron microscopes, JAXA said it had confirmed that about 1,500 particles were indeed material from a rock and that "almost all of them are extra-terrestrial and come from Itokawa". Scientists believe asteroids can help reveal secrets about the birth of the solar system 4.6 billion years ago. The celestial bodies are believed to retain materials from the solar system's earliest days, unlike scorched remains such as meteorites or materials on Earth which have been transformed through high pressure and heat. "This is really an amazing achievement for the Hayabusa team," said Paul Abell, lead research scientist into planetary small bodies at the NASA Johnson Space Centre in Houston, Texas. "After all the hard work and the many years of patiently waiting, we now can say that we have returned samples from an asteroid to the Earth for the very first time," said Abell, who was a member of the team which recovered the pod from the Outback. "The science that we will obtain from these particles over the next few years will be invaluable for understanding the nature of near-Earth asteroids and the materials that existed during the formation of the early Solar System."